Infamous: Second Son is the Derek Zoolander of next-gen games: It is really, really, ridiculously good-looking. To put it in technical terms, there are a hell of a lot of graphics in this game. Okay, actually, that's not very technical. But in my largely un-technical estimation, Second Son has the best visuals I've seen in a next-gen console game by a wide margin, and I was regularly gobsmacked by it all. The first time I fired off some neon powers in a darkened room, I couldn't help but grin at the colors sparkling and bouncing off of one another, shadows dancing like crazy. The lighting effects, the superpowers, and the seemingly endless draw-distance, letting you see the far corners of Seattle as you survey the horizon. There's more to a game than mere visual effects, but sometimes it's nice to simply allow yourself to be dazzled. 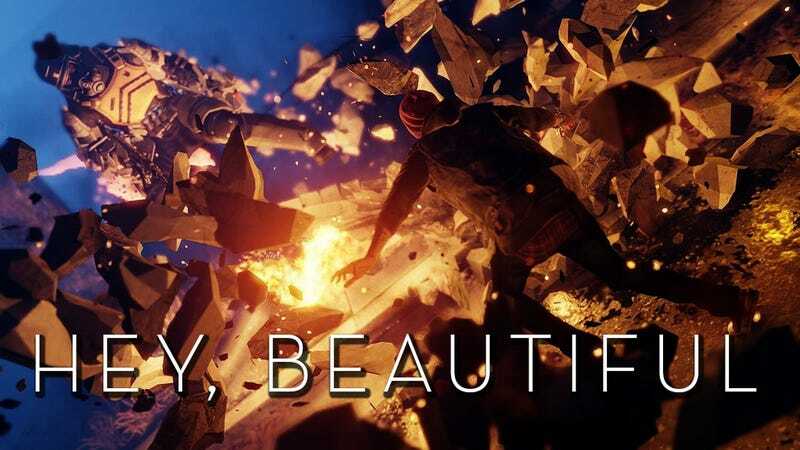 As happy as I am to sit back and enjoy the prettiness (and as a critic, as willing as I am to acknowledge that many of the things about Infamous games that annoy the piss out of me are back and/or even worse in Second Son), I'm also glad that the gearheads at Digital Foundry have taken the time to do a thorough analysis of the new game's visual performance. Their verdict: Yep, this game looks really nice. The presentation is meticulously clean, almost pristine - operating with a full 1920x1080 framebuffer alongside a modified form of SMAA T2x that stands apart as the most impressive utilisation of post-process anti-aliasing we've seen on any platform. This high-quality solution combines MLAA with a temporal component delivering incredibly sharp and clean imagery with excellent edge coverage throughout. Ghosting artefacts associated with the temporal component are relatively minor and typically relegated to smaller floating objects such as blowing sheets of paper or birds. Image quality purists should also note that anisotropic filtering is fully present and accounted for - unlike a number of other recent PS4 releases. They were similarly impressed with the particle system, which is responsible for the smoke, neon, and other colorful special effects. Another interesting note, Delsin's character model consists of more than 60,000 triangles with 7500 specifically used for his beanie. (To put that into perspective, Alyx Vance from Half-Life 2 used just over 8000 triangles for her entire model. That's one detailed beanie.) As an open-world game we also see a large number of pedestrians, DUP soldiers and vehicles populating the screen. The sheer amount of geometry being rendered at any single time is quite impressive. Texture quality is also of extremely high quality with signs, billboards and surface textures alike all exhibiting extremely sharp, high-resolution textures throughout without any evidence of texture streaming issues. As a lot of you probably know, I've become somewhat obsessed with frame-rate lately, and from the get-go I noticed that Second Son was frequently kicking up to 60fps, usually when the camera angled up at the sun. It'd then dip down closer to 30 as the action got hectic, and only hit major slowdown when I'd trigger one of the ultra-super-mega-powers (my term) that can take out city blocks' worth of bad guys. This kind of unlocked frame-rate is apparently standard practice with the past games in the series, though I hadn't noticed it when I played the PS3 games. I'm a fan of this approach, generally; I liked the unlocked frame-rate in the PS4 version of Tomb Raider, as well. The Digital Foundry guys aren't the biggest fans of the way Second Son's frame-rate dips and bounces back, but I'm actually happy to have things frequently hanging out in the 40-50fps zone. And both versions look better than the PC version. You can find more in-depth stuff in Digital Foundry's full analysis. I have my share of gripes about Infamous: Second Son as a game, but I really can't complain about how it all looks. (And really, it's plenty fun enough, particularly in the middle bits when you have a few high-level powers unlocked.) I'm glad to see that game studios are already making next-gen games that look this good. Considering that we're still in the very early days of the new console generation, I'm excited to see what's next.